Today will feature a classic regional split with an upslope/downslope pattern. The coast will see temps rise to around 40 under partly to mostly cloudy skies while the mountains remain under mainly cloudy skies with temps in the upper 20’s to low 30’s. Snow showers are also likely in the mountains. In Yarmouth, I woke up to a coating-1″ of snow and nearly a quarter inch of ice which made things extremely slippery. Many other coastal areas got the same thing and inland areas likely saw similar stuff as well so if you’re traveling anywhere south of the mountains, expect very slick roads this morning. Our storm from yesterday really only half cleared out. The snow is gone but the clouds will remain. Look for mainly cloudy skies with temps in the 20’s north to around 30 south. Everyone is at risk for light snow as well. With a front hanging near the mountains, the mountains are likely to see snow showers on and off today with some accumulation at elevation. We’re getting grazed by a coastal storm tonight so don’t be surprised if you see some flakes this evening near the coast. Areas far east near Belfast might see enough light snow for an inch or two, the rest of the coast is likely to see just a coating. Basically, almost everyone sees some light snow today but with the exception of the mountains and the immediate, eastern coast, additional accumulation is unlikely. Most of the heavy snow and sleet is off to our NE now as the mid levels dry out. Despite a lack of heavy precip, snow and sleet will still remain across the area this evening with another inch or so of snow and a coating of sleet and possibly a glaze of freezing rain as well. This continued light precip will cause roads to remain slick through the next few hours so continue to use caution if travelling. Seeing as the storm is winding down, this will be my last update today. I’ll be back tomorrow morning with a look at tomorrow’s weather. Heavy snow and sleet is ongoing across the region currently although the worst of the worst is now mainly NE of Portland. I expect moderate to heavy snow and sleet to continue for the next few hours with the worst gradually sliding NE. This afternoon, look for the second phase of the storm which is already beginning across southern areas which includes lighter mixed precip. In Yarmouth, what I’ve been seeing generally seems to match up with other reports I’m seeing on mPING and on Twitter from folks across southern areas. Snow has been heavy here and is mixing with sleet. The sleet is piling up though, I’ve gotten about an inch of sleet on top of 4.5″ of snow as of 10:30. Keep in mind everything is still quite slick out there so use caution if traveling! Snow continues across the region this morning. Here in Yarmouth, there was a period of sleet around 7 but the precip has since turned back to all snow as heavier precip moved in. As of 7:45, the precip remains all snow with very efficient accumulation. Due to cold temps around the area (10’s for most, 20’s coastal York county), the snow is dry and fluffy. I suggest shoveling/snowblowing now before the sleet turns the snow into frozen cement. Snow and sleet will continue with sleet moving north east through the morning. It seems that a middle of the road solution is playing out across areas north of York County with snow during times of heavy precip and sleet when precip is lighter. This will continue through the morning. There are reports of many accidents across the are this morning and roads are very slick especially if your area is seeing sleet. Use extra caution on the roads today if you must travel. Also, remember to use your mPING app today! There has already been tons of great data flowing in and it’s really helping with the forecast! Today will feature a messy winter storm as low pressure moves through the Great Lakes. 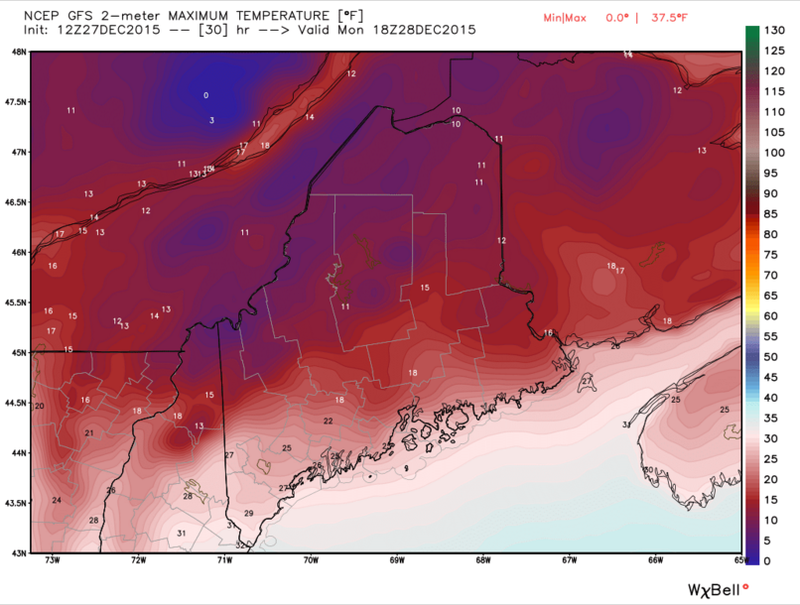 Warm air will be rising up and over a well-defined cold pool at the surface. This is the lifting that will produce moderate to heavy precip today. I’ve been digging into the depths of the forecast the past few evenings and now it’s time to bring it all together. Snow is falling across northern parts of New England this morning. Sleet has mixed in as far north as Manchester, NH as well indicating a warm layer already developing aloft. 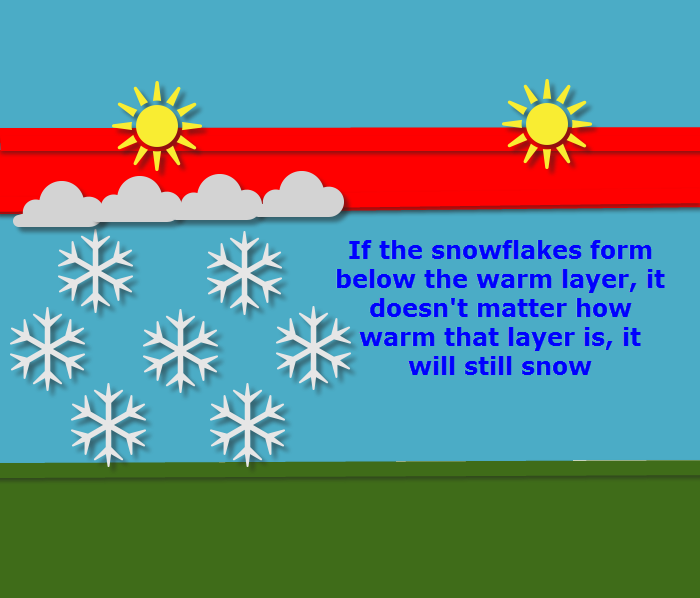 There are two possible solutions with this morning’s snowfall. Our first option is that the sleet line progresses as it has in the past hour unimpeded in its relentless march NE. This would result in sleet arriving during the heaviest of the precip, several hours earlier than last night’s forecast. Should this occur, look for totals lower or just under the lower end of the range from last night’s map (re-posted below). The other idea (this is the one you see above with the HRRR) is that the precip is so heavy that it dynamically cools the atmosphere. This has to do with the displacement of mass and is a topic for another day but the point is that if this occurs, the mid levels of the atmosphere could cool enough to allow for a little more precip to fall as snow thus resulting in totals more towards the middle or even upper end of the total ranges. Be prepared for either of these solutions. Remember even though it accumulates more slowly, sleet is icier and more slippery than snow. It is harder to drive in. Take it slow out there this morning. After the initial burst of snow comes through this morning, precip will shift to a lighter more spotty type. This will fall any number of ways depending on your location. A mix of snow, sleet, and freezing rain is likely across the south with snow and sleet farther north and all snow up in the mountains. The freezing rain expected across the south will continue to cause very slick roads. Slick travel is expected everywhere today but in terms of a complete lack of traction, nothing beats .1-.3″ of ice on top of an inch or two of sleet on top of 4-6″ of snow. Help Forecasters Track The Storm! Given the plethora of precip types incoming with this storm, tomorrow would be a great time to give the mPING app a workout! Over the past few days you’ve seen how hard it is to forecast multiple precip types. Here’s a chance for you to help forecasters out! Simply download the free app and take a look outside! Send in your report of snow, sleet, freezing rain, or rain and you can help forecasters like me with forecasting multiple precip type events! The data is sent to the National Severe Storms Laboratory to help with radar development which gives models better data which improves forecasts. Read all about it over on the NSSL webpage. Also through that website, you can view your report and everyone else’s reports to track the rain/snow/sleet line in real-time! This is one of my most valuable tools for tracking the mix line to verify the forecast/make adjustments if needed. Happy reporting! 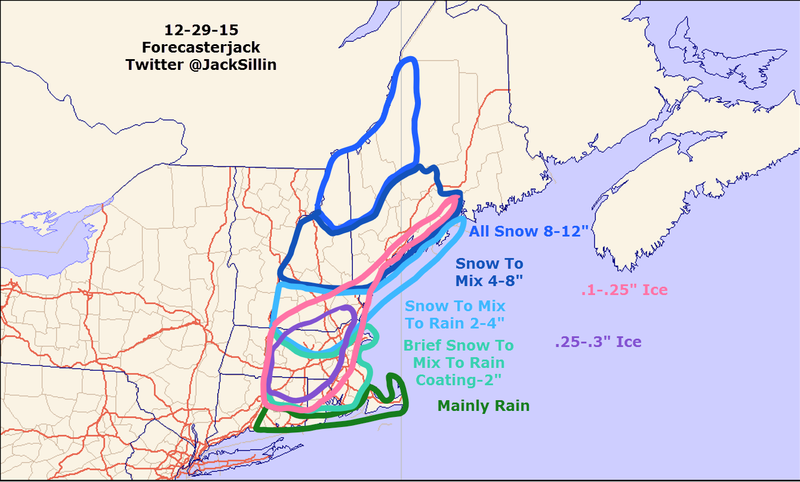 I keep my map the same this morning as I think each solution (warm or cold) is equally likely. There are interesting radar trends that indicate the colder solution is playing out though you can’t go against hurricane force winds 10,000 feet up blasting in warm air. We’ll know more as the morning goes on and I’ll keep updating this post as I see changes happening. Keep checking back right here through the morning and I’ll have new info at the top of the page as it comes in. I will also be on twitter with updates all morning @JackSillin. Here is the link to last night’s post as the information there more or less remains the same. Clouds are overspreading the area ahead of our next storm this afternoon. Today’s cold weather was brought to you by a sprawling high pressure system moving in from the west. This high will set up shop to our north and become locked in providing a plentiful supply of cold air. A low pressure system is moving up the Ohio valley into the Great Lakes region this evening as well. A long fetch of moisture is setting up beginning in the Gulf of Mexico and dumping out just to our west. Overnight, the moisture feed will move east, overhead, and snow will begin from west to east. By dawn, everyone will have snow falling with an inch or two on the ground. Snow will become moderate to heavy through the morning hours at which point sleet looks to mix in for southern areas. Lets break it all down. Snow will arrive from west to east tonight and will be light to moderate through dawn. Moderate to heavy snow will arrive after dawn in time for the morning commute. This period of time is when the accumulating snow will fall for SW areas and at the immediate coast. Falling snow will cause visibility problems in addition to slippery roads due to the accumulating snow. All and all, a pretty messy morning commute is expected. The NAM sounding for Portland tells us a lot about this phase of the storm. 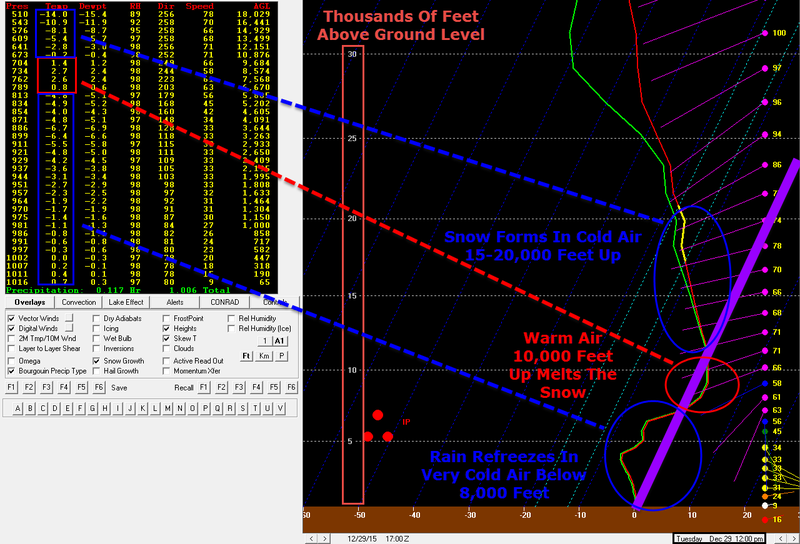 Snow will fall into a warm layer right around 10,000 feet. The snow will then melt, falling as rain. However, we’re not at 10,000 feet here in Maine. The cold air from today will remain locked in at the surface. The rain will then re-freeze into sleet and that’s what many in southern areas are likely to see. Farther north up into the mountains, the precip type is likely to remain all or mostly snow. The image is showing what the temperature would be like if you traveled straight up in the atmosphere from Portland. After the main push of precip comes to an end tomorrow afternoon, some moisture will continue to linger in the lower levels even as the mid/upper levels dry out. This will result in a period of light precip that will continue through late tomorrow evening. Across the south, this will be a mix of snow, sleet, and freezing rain. Across the north, more snow is likely. While accumulations will likely be limited from this phase of the storm, the big thing will be that it will continue to keep roads very slippery especially across the south where sleet and freezing rain is most likely. Even after the heavy precip has stopped, roads will continue to be very slippery so continue to use caution through tomorrow night. Overall, not a huge storm by New England standards but given what we’ve had to deal with so far this season, it will be reasonably impactful. Warm air could creep in along the east side of a coastal front Tuesday afternoon but Coastal York county south is where impacts should be confined to. Given the plethora of precip types incoming with this storm, tomorrow would be a great time to give the mPING app a workout! Over the past few days you’ve seen how hard it is to forecast multiple precip types. Here’s a chance for you to help forecasters out! Simply download the free app and take a look outside! Send in your report of snow, sleet, freezing rain, or rain and you can help forecasters like me with forecasting multiple precip type events! The data is sent to the National Severe Storms Laboratory to help with radar development which gives models better data which improves forecasts. Read all about it over on the NSSL webpage. Also through that website, you can view your report and everyone else’s reports to track the rain/snow/sleet line in real-time! Happy reporting! I’ll have another update tomorrow morning and will be on twitter for most of the day tomorrow with more frequent updates @JackSillin. Today will feature cold high pressure moving in from the NW ahead of our first winter storm. Check out last night’s update for details on that, I’ll have another detailed update this evening. For today, look for chilly temps and a chilly wind to make it feel even chillier. Highs will range from the upper 10’s/low 20’s up north to the mid to upper 20’s down south. There may be a stray 30 right at the coast but everyone should stay below freezing. Mainly sunny skies are expected for most of the morning though clouds will start to arrive by the afternoon hours ahead of our next storm. I’ll have another full blog on the storm this evening. A cold front is currently moving east through the region and will push offshore this evening. Behind it, a sprawling high pressure system will build in straight from Western Canada bringing with it our first real shot of cold air. On Tuesday, warm air from the tropics blasted up the coast by the storm currently causing trouble in Texas will smash into the cold air and a good burst of snow will result. Here’s how I think it will play out and why. Highs will remain below freezing tomorrow for everyone except maybe far southern York County. Highs near the international border will struggle to get out of the single digits. That doesn’t include the NW breeze which will definitely be felt. This is our source of cold air for Tuesday. Prepare for January like temps and wind chills which compared to this torch of a December will feel quite chilly! At the same time, the storm that is bringing a slew of problems to Texas will be moving North through the Ohio valley. 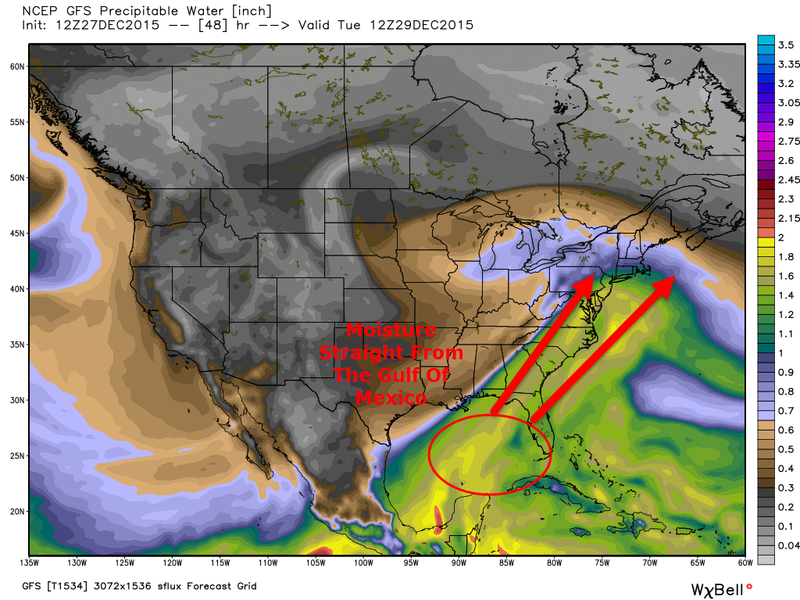 This will set up a feed of warm moist air from the Gulf of Mexico right up the coast to Maine. This will cause some concerns as the moist air also comes with warmth which will cause concerns for mixing towards the end. The cold air comes tomorrow and the moisture arrives on Tuesday. The collision is what will cause the snow. 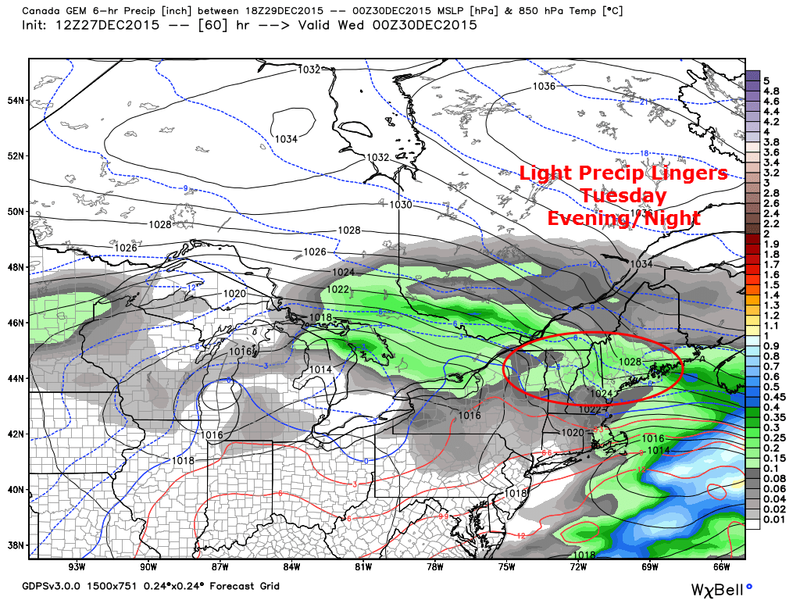 At the moment this looks like a front end thump of snow during the day Tuesday followed by a lighter period of mixed snow/sleet/freezing drizzle/drizzle on Tuesday night. Let’s dig into the snow first. 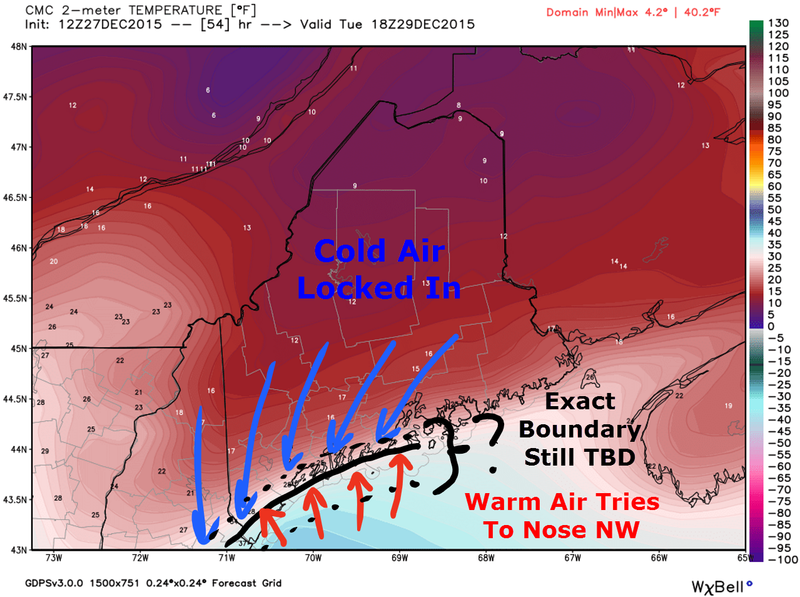 As warm air plows northward, it will run into the cold air that arrives tonight into tomorrow. This will allow for heavy snow to form on the leading edge of the warm air as it is forced up and over the cold air. This map from the 12Z GFS shows strong forcing (that’s how the moisture in the air is squeezed out) Tuesday morning. Expect slick roads and heavy snow starting Tuesday morning and lasting through Tuesday afternoon/evening. This is when most of the snow will fall. A general 4-8″ is expected with some seeing more and some less. See the snowfall map below for more details. 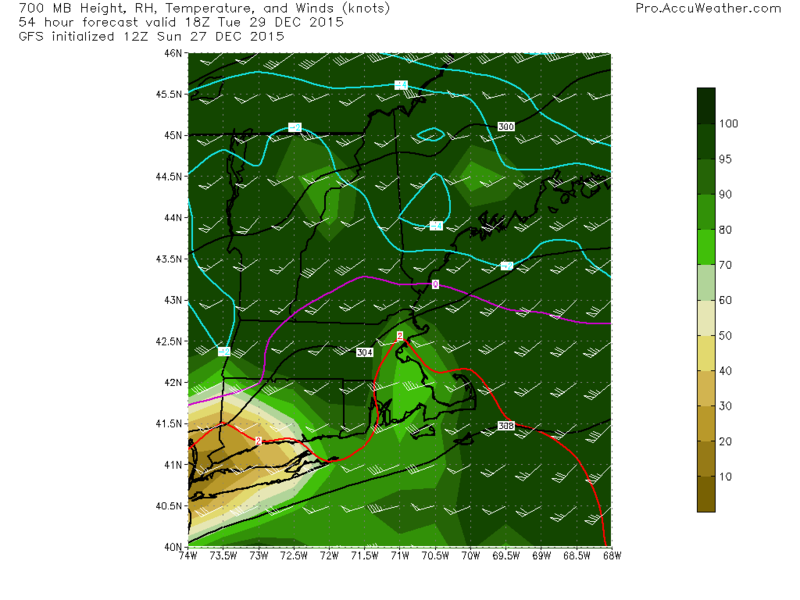 Southwest winds bringing the warm moist air into the region will eventually bring in warm enough air to start causing mixing problems especially in Southern New England. My current thinking is that Warm air aloft gets as far north as the MA state line during the tail end of the steady precip. Lighter precip will linger through the evening and areas as far north as Portland could see some light sleet/freezing rain overnight Tuesday. If warm air moves in earlier/farther north than forecast which is a possibility, totals could be cut down in SW ME and NH. Northeast of route 26 is likely safe from any impactful sleet. The other concern for precip type will be along the immediate coast where a coastal front is likely to form. There will likely be a tight temperature gradient along this front and if you end up on the SE side, temps could rise high enough to change the precip to a rain/snow mix. This threat is greatest along the coast south of Portland and along the tips of the peninsulas. Wherever this sets up, look just to the NW for heavier precip associated with the warm ocean air moving up and over the cold locked in at the surface. Warm air rising over cold air is what is causing this whole mess on a large scale, the same thing happens on a small scale. After the main snow event moves east Tuesday evening, lingering low level moisture will contribute to light mixed precip lingering through the first half of Tuesday night. As warm air completes its invasion aloft Tuesday evening, this could fall any of a number of ways, snow, sleet, freezing rain, or rain. The precip will be light so the impact on snowfall totals will be limited. I’m thinking that because the moisture is below the warm layers, it stays mostly snow. The warm air moves in at 700mb (10,000 feet or so) but the cold stays tough below that (the blue lines on the map above indicate subfreezing temps at 5,000 feet). The moisture is in the low levels (where the cold air is) and thus even though 700mb is warm, I could definitely see another inch of snow as the snow falls in the low level cold layer. Regardless, this will keep roads slick through Tuesday night despite the heavy precip being gone. 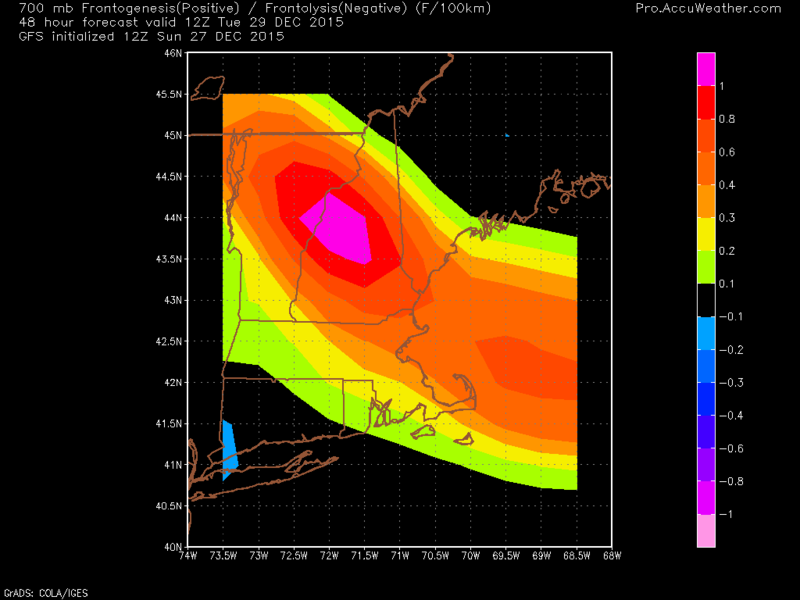 Looking at the final snowfall amounts, I expect a general 4-8″ for Northern New England with less to the south. I think someone sees 10 or 11″ and the best chance looks to be either in the mountains where deep cold stays really locked in contributing to a drier snowfall that accumulates faster or near the coast where the coastal front contributes to more liquid falling from the sky. 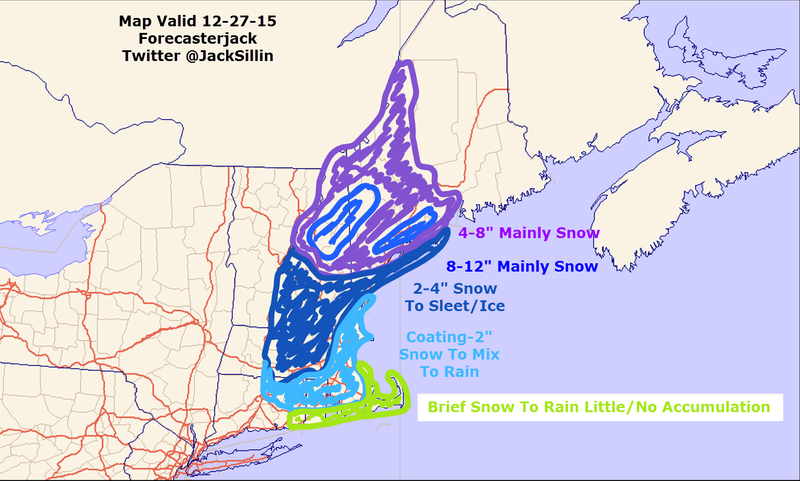 The coastal ‘jackpot’ area largely depends on the ocean air staying farther SE and the sleet being kept at bay. The northern Jackpot is dependant on enough moisture moving that far north. 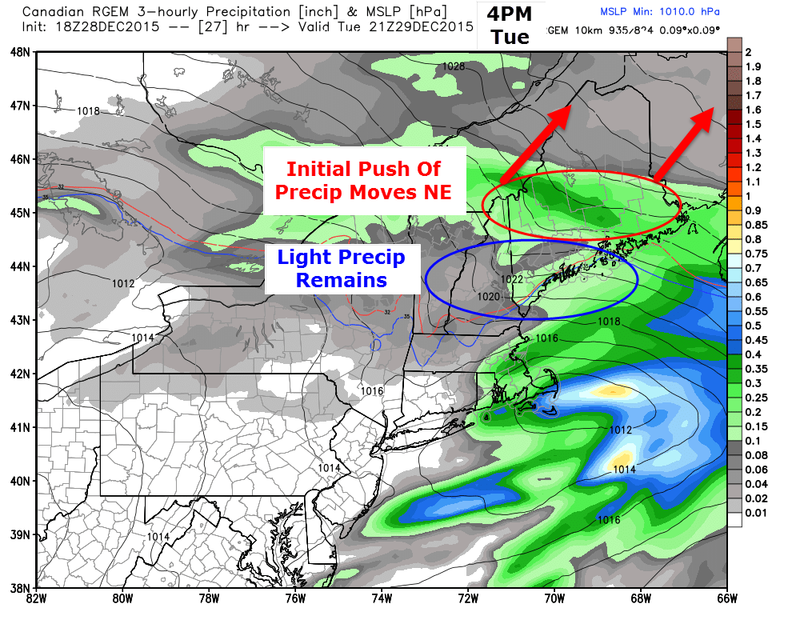 A coastal low developing Tuesday evening will try to steal some of the moisture from NW areas. I’ll have another update tomorrow evening on the storm, details on tomorrow’s weather will come tomorrow morning. Every precip type under the sun (except hail, it’s not hailing anywhere this morning, that’s sleet!) can be found somewhere in Western Maine this morning. We have snow in the north, sleet and freezing rain in the foothills, and rain in the south. Don’t forget some graupel (clumped together snowflake balls) just north of the sleet mix line. Snow will continue in the far north and rain in the south as the forecast from yesterday remains on track. Sleet will slowly work its way north today but should remain mostly SW of Route 27 as low pressure moves over northern areas. All and all, the forecast from last night remains on track. a good 4-8″ is expected for the far north with a mix of all precip types in the foothills/western mountains and rain in the south. Rain will move east out of the area following a cold front tonight. Temps today will depend on location: upper 20’s to low 30’s north, low to mid 30’s in the foothills, and mid to upper 30’s in the south. I’ll be back this evening with a full update on Tuesday’s storm. I’ll also be on twitter today with updates more frequently @JackSillin.